Ever wonder where the Coyote buys his ACME products? Apparently from Sears. An “Acme Ventiduct” certainly sounds like a product he would order to help catch the Roadrunner…but this is a room heater, from the days before Nest-controlled central heating. I suppose if you can hide the heating in wall ducts, floors or ceilings, then you might as well flaunt it. Beyond Edwardian, this is over-the-top Victorian – practically Rococo. 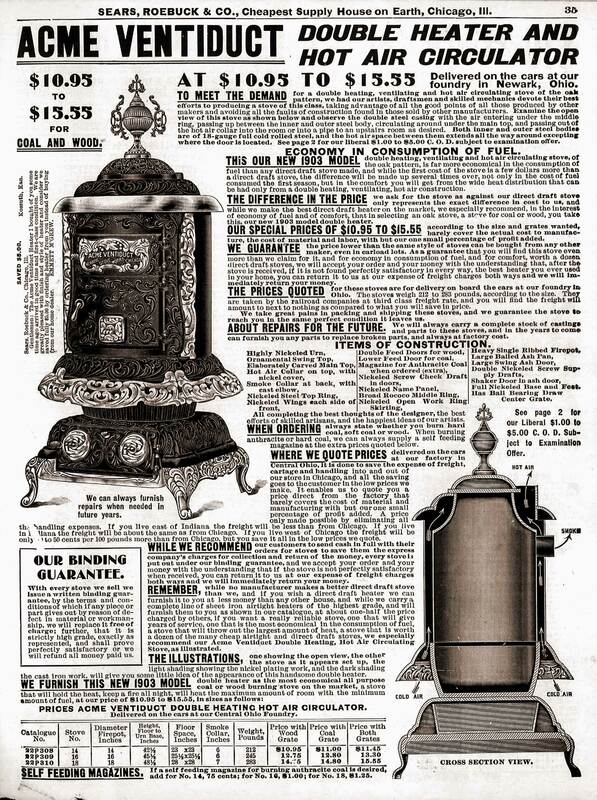 If the ornate style of this “handsome double heater” doesn't sell you, the catalog copy will. Click the picture to zoom in and read. Very much in Sear's turn-of-the-century mode, every last inch is filled with product details, benefits, guarantees, testimonials: everything you could possibly want to know to help you make a purchase decision and get the heater shipped direct from the foundry to you via rail. Weight – 213-283 pounds! An automatic anthracite coal-feeding attachment is available so you can sleep and still stay warm. 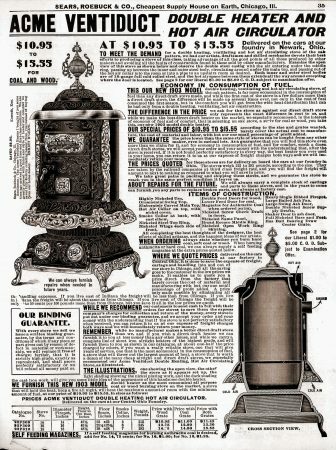 A roadrunner roasting attachment is not mentioned, but there are equally ornate stoves on other catalog pages.